Chipotle Copycat Corn Salsa is a sweetish salsa with a hint of spice. It brings together the spice of jalapeños with the sweetness of the corn. Here is how to make it. Corn is perhaps the most versatile of vegetables. Grown as ears or kernels, they are fresh, sweet and add their own taste and flavor to every dish. Whether munching on fresh or steamed corn or cooking them in rice or gravy dishes, corn adds a unique taste to food, is versatile and delicious too. Who doesn’t love the Chipotle Restaurant Chain in the US? This was the first place I tasted Mexican food and totally loved it. I found it to be an easy one to relish and enjoy. I am sure a lot of Indian will agree with me? My family loves it too and we usually enjoy tacos, salsa and salads every once in a while. I’ve always assumed that since the ingredients look fresh, it must be easy to put together, but it was a pleasant surprise when I started experimenting with the recipes. Although quite obvious, the cuisine makes use of ingredients in a versatile way, adding many of the native spices but incorporating newer ones. I have had one of the best corn salsa at Chipotle, a Mexican food chain in the US. After coming back to India, I tried to replicate the recipe and came pretty close. Mexican cuisine makes plenty of use of corn in their salsas and salads. Since much of their cuisine is earthy, uncooked and fresh, this vegetable makes for a great option. Chipotle Copycat Corn Salsa is a sweetish salsa with a hint of spice. It brings together the spice of jalapenos and black pepper, with the sweetness of the corn kernels. 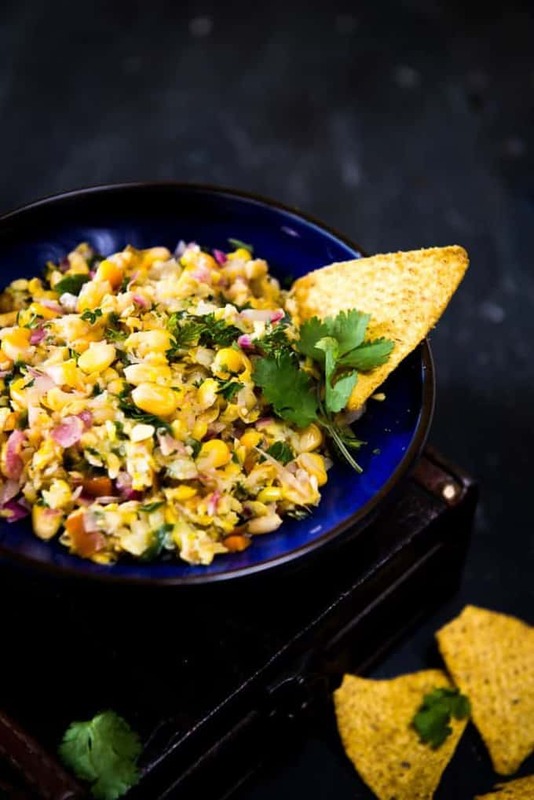 This corn salsa is an incredible topping for tacos and salads. 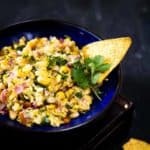 Whether on chicken tacos, as a dip for Grilled Chicken Quesadilla and Homemade Tortilla and Mushroom and Bell Pepper Pizzadilla, or salads such as Texas Style Potato Salad, this salsa adds its own unique flavor to every dish. 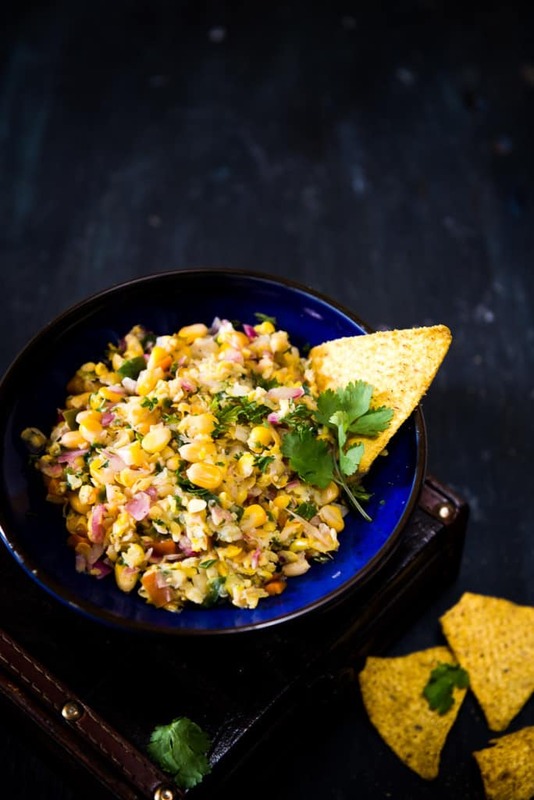 Here is how to make Chipotle Copycat Corn Salsa. Chipotle Copycat Corn Salsa is a sweetish salsa with a hint of spice. It brings together the spice of jalapeños with the sweetness of the corn. Add Jalapeno peppers, red onion and coriander in a food processor and chop roughly. Add corn kernels, salt, black pepper and lemon juice and mix well. Add the mixture in the blender and pulse a few times. The salsa should be chunky.